In the Nov. 2014 issue, this magazine detailed how ICF use came to dominate the midrise market in Kitchener/Waterloo, Ontario. 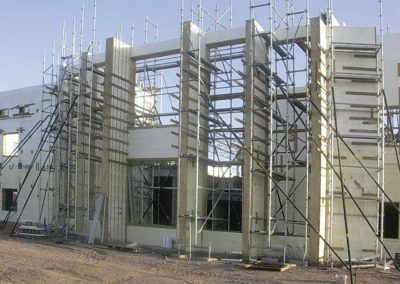 This article, the second in the series, outlines how ICFs gained popularity in Arizona’s commercial sector. 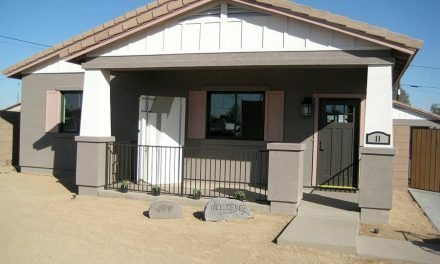 ICF use is well-established in Arizona. 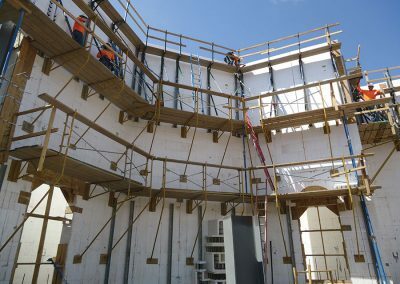 The hot climate and extreme daily temperature fluctuations make foam-and-concrete construction attractive for energy savings. Additionally, construction is robust due to the region’s phenomenal growth. For years, Maricopa County—home to the Phoenix/Tempe/Mesa metro area—has ranked among the fastest growing counties in the nation. In 2015 alone, the county grew by 88,000 residents, more than any other county in the United States save one. Other cities—Flagstaff in the north, Tucson to the south, and Yuma in the southwest corner of the state—are also growing quickly. Many would credit the Phoenix Diocese of the Catholic Church. 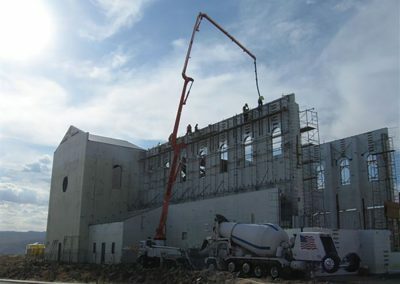 Gary Fetters of ICF Specialist, a leading ICF installer says, “The diocese has been a major, major player here, and they still are,” The church has commissioned at least 16 major projects in the past ten years. But the story goes deeper than that. 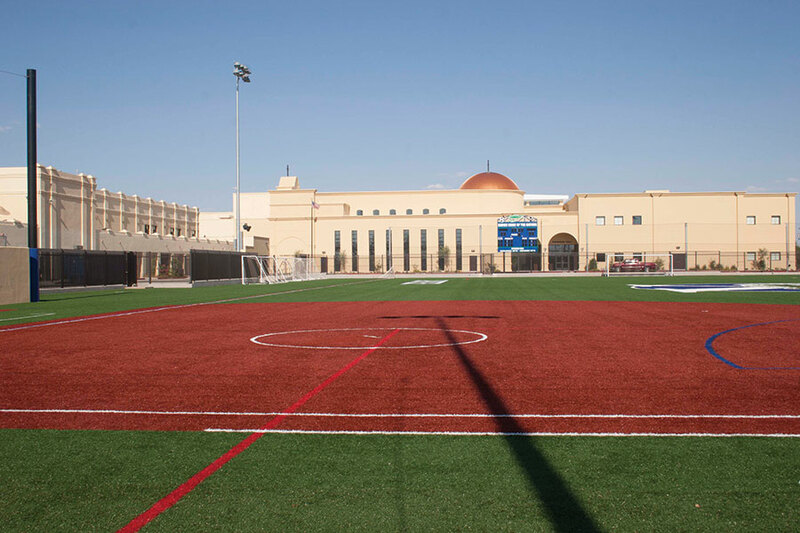 One large project in Phoenix involved rebuilding an entire school campus. Xavier College Prep High School (top) included a gym, social hall and parish administration building. Adjacent is Saint Francis Xavier Elementary, which has two classes per grade, and a church. The buildings total nearly 180,000 sq. ft. The five-story Phoenix 911 Emergency Services Center is one of the largest municipal buildings in the area, and used ICF for blast and bullet resistance. According to Robert Klob, the first commercial ICF projects in the Phoenix area were actually fire stations. These were built with composite ICFs. At the time, Rastra was headquartered in Scottsdale, and several competitors were nearby. 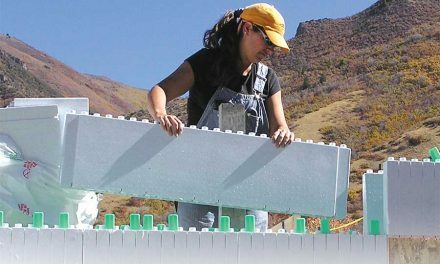 In the early 2000s, as a new generation of robust all-foam blocks became available, distributors tried to get specc’ed for that work. 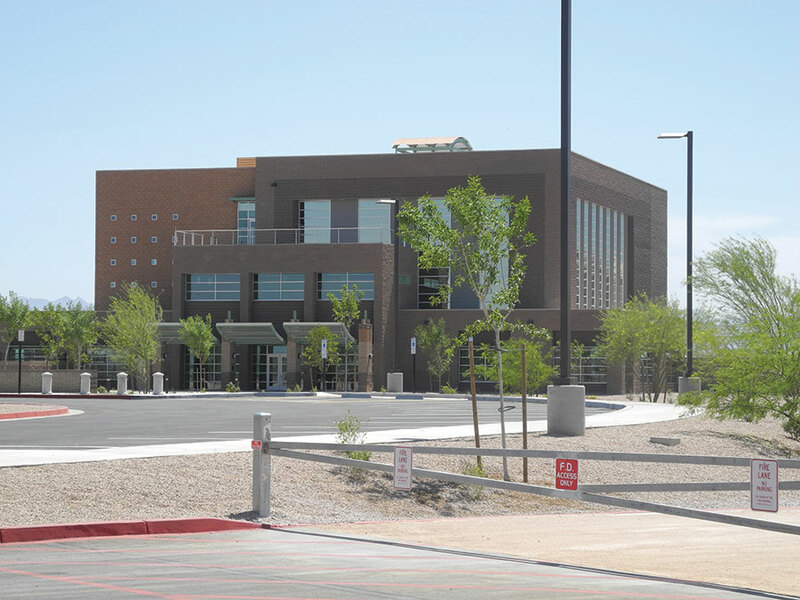 Phoenix chose ICFs again for a five-story regional emergency dispatch center, this time for durability as well as efficiency. 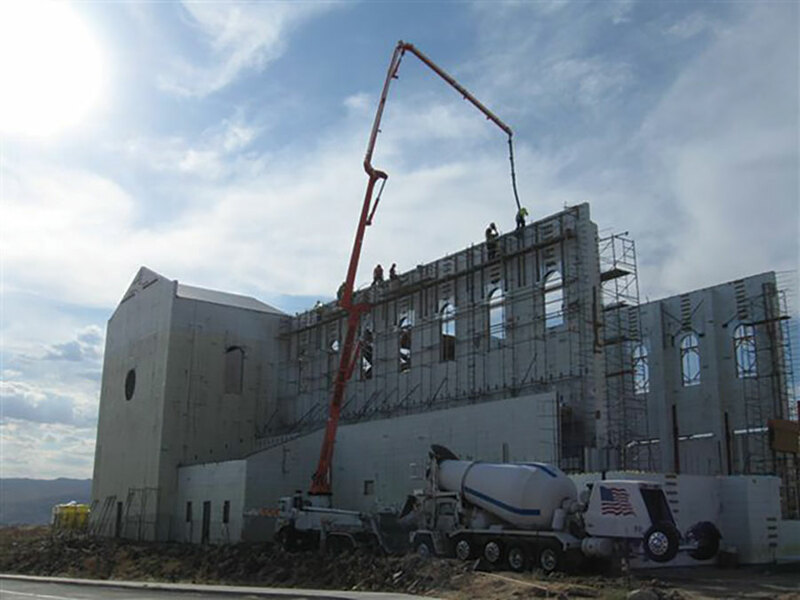 The reinforced concrete walls help the $8.8 million facility achieve a Level 4 blast and bullet resistance rating and meet NFPA (Homeland Security) guidelines. Completed in 2013, it was constructed with 26,000 sq. ft. of Fox Blocks ICF. Leake says the dispatch center is the eleventh ICF project commissioned by the department, and the largest municipal building in the metro area. Based on the success here, ICF fire stations are now seen in Las Vegas and other areas of the Southwest. That hustle led to jobs. Shortly after the fire department switched to ICFs, Harkins Theaters began looking at the material for theater construction. Based in Scottsdale, they’re the fifth largest multiplex chain in the country. 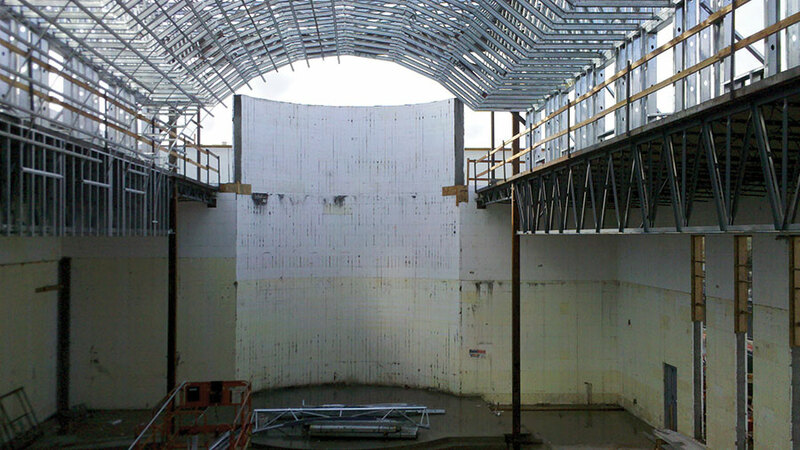 ICFs have an STC rating in the mid 50s, virtually eliminating sound transfer between theaters. Fetters convinced them to try it for one job, and they were sold. 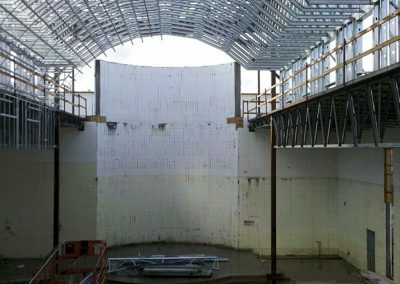 Now, all new theaters in the five states they operate in are built with ICF. Several are currently under construction in Arizona, including a 16-screen multiplex in Flagstaff, a similar sized project adjacent to Fashion Square Mall in Scottsdale, and a 70,000-sq.-ft. multiplex in Goodyear, west of the metro area. 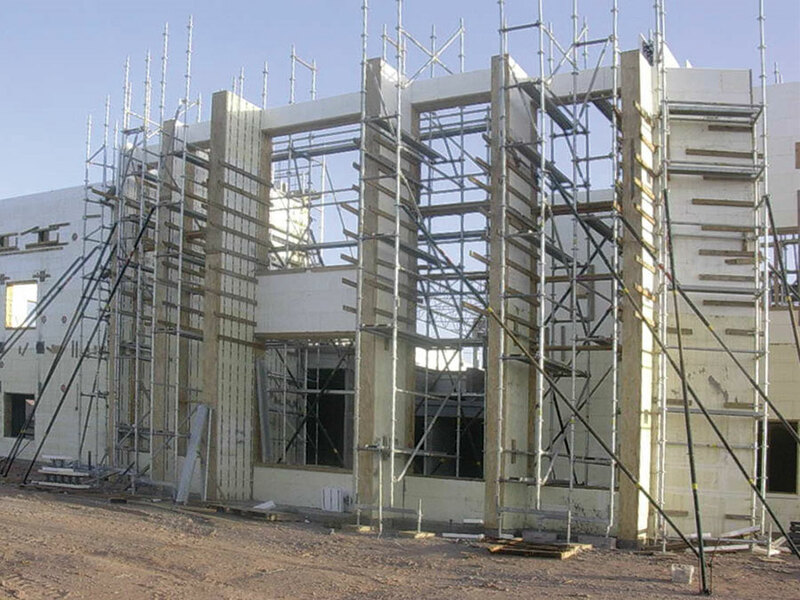 St. Margaret Mary Church in Bullhead City was the first ICF project for the Dioces of Phoenix. The success of this complex project led to ICFs being specc’d for more than two dozen other large commercial jobs. 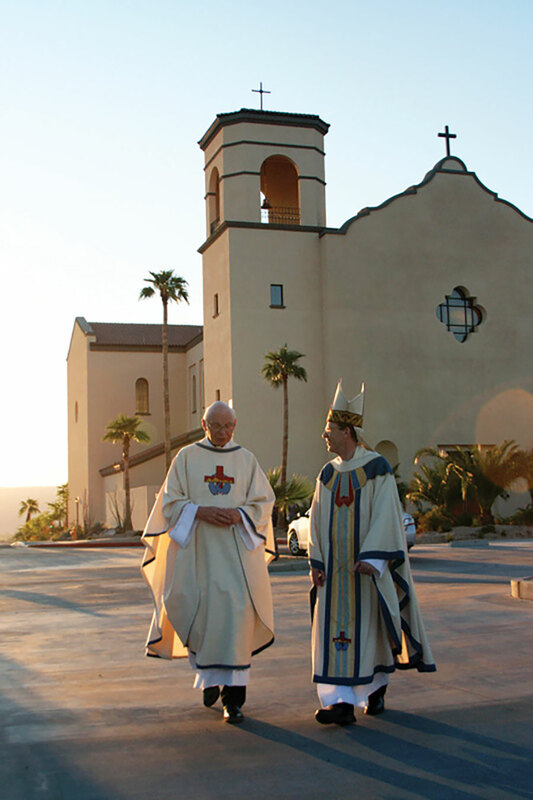 Ten years ago, the Phoenix metro area was gaining nearly 200,000 people every year, and the Roman Catholic Diocese of Phoenix was one of many organizations scrambling to meet the needs of the growing population. John Minieri, director of real property and facilities, and his assistant Patrick Hintze took the lead in determining the best way to serve the growing number of parishioners. The diocese chose Quad-Lock for the first project. 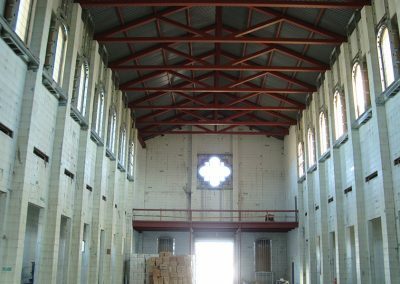 John Hatfield, who was worship facilities manager for Quad-Lock at the time, characterizes the change from masonry to ICF as a “rather large battle.” The stakes were high for the construction team. 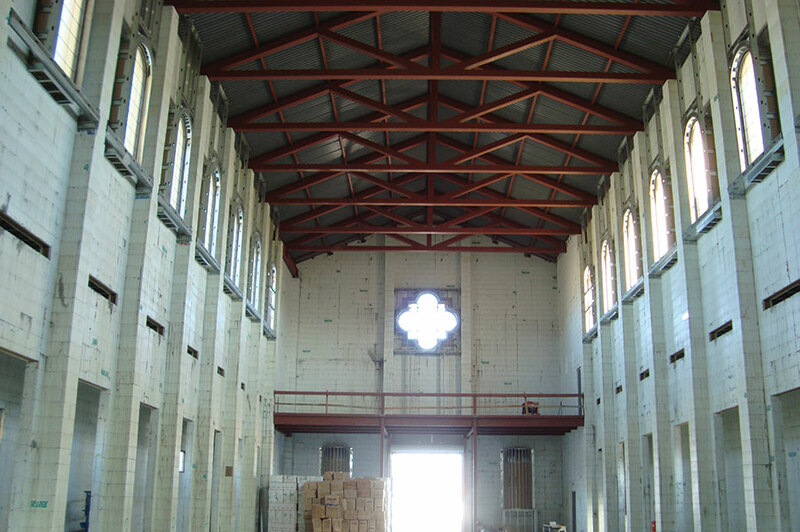 St. Margaret Mary Church has 58-foot freestanding walls, with gables reaching to 76 feet. The design called for 6” core, with ICF pilasters every 16 feet. 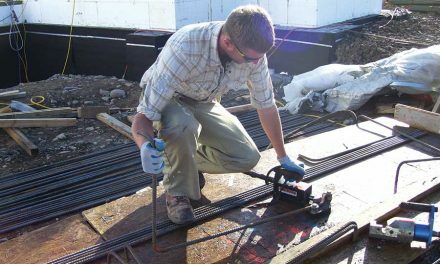 They also used Helix to minimize the amount of horizontal rebar. ICW did the install, and the final results were impressive. The change from masonry to ICF cut the cooling load in half, and construction costs were comparable. The diocese was impressed enough to spec the next several projects as ICF. 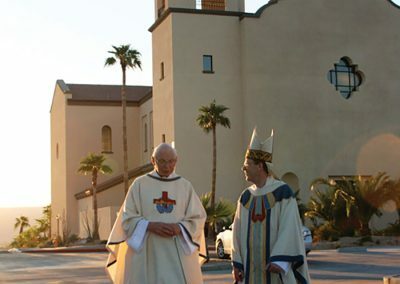 In short order, they commissioned St. Mary Magdalene Church in Gilbert; Immaculate Conception Catholic Church in Cottonwood, and two high schools; Seton Catholic High School in Chandler and Xavier College Preparatory High School in Phoenix. All were built with ICF. Much of this construction is funded by the proverbial “widow’s mite,” and Minieri wasn’t shy about ensuring he was receiving the best value for his dollar. The first two projects were built with Quad-Lock, but the Gilbert facility used Greenblock, and the high schools used BuildBlock. Competition was stiff among general contractors and the ICF subs as well. 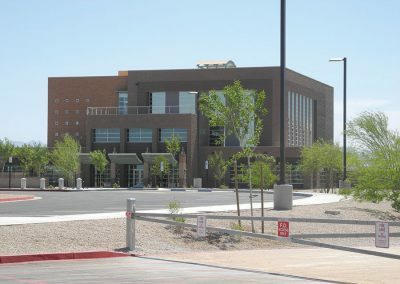 ICW fell victim to the recession, and the ICF work for the most recent projects, including both high schools and the Newman Center adjacent to Arizona State University have been built by ICF Specialist, the Fetter’s company for commercial installation. Fetters says, “No question about it, the churches have been a big driving factor here. People drive by and call.” Among the calls are other churches and school boards. Of course, the Catholics aren’t the only ones building churches with ICF. 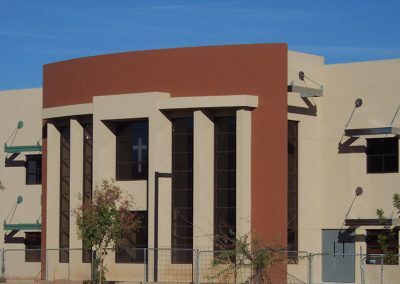 Sun Valley Community Church in Gilbert was finished in 2007. It covers 84,000 sq. ft. in three separate areas, worship hall, mezzanine, and classrooms. 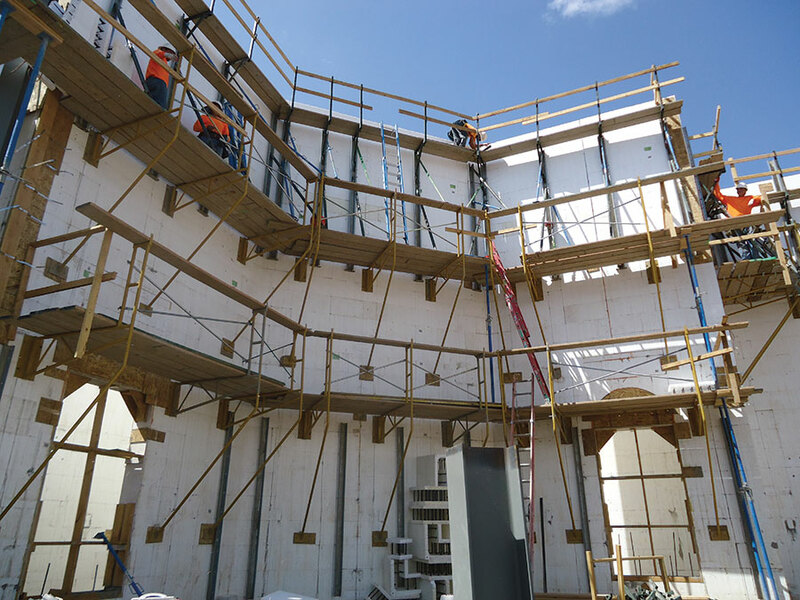 ICFs were used for exterior walls as well as demising walls between the three components of the building to reduce sound transmission just as in theaters. 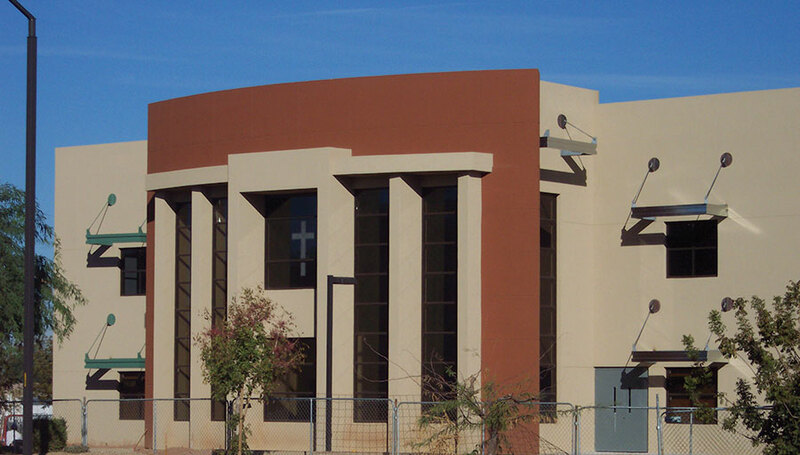 More recently, Our Lady of Sorrows Church was completed in Phoenix (see story on p. 16 of this issue). 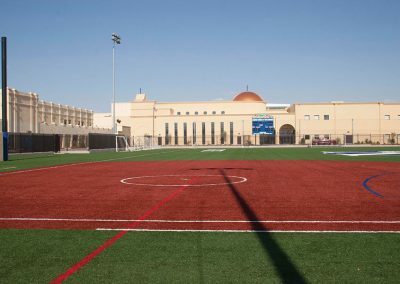 Similarly, ICF school construction outside of the diocese is also common, including a Green Safari School built with Amvic; and Ironwood Hall, a community college in the southeastern suburbs of Phoenix that achieved LEED-Silver certification. The Newman Center adjacent to the ASU campus had unusual angles, tall walls, and multiple windows. These features are quite common in commercial ICF work.